The patented Vertex VMS (Vertical Measuring System) is unique in the field of Digital Height Gauges. Introduced in 2013 and supported by UKAS Certification, the Vertex VMS is the most advanced digital gauge available on the market today. Due to manufacturing excellence, the gauge does not require error-mapping, yet has a maximum error over a range of just 3.5 microns. The Vertex VMS is available in 3 sizes: 800, 1000 and 1200. This enables us to cater for several industries, and it allows you to get the most out of this unique digital height gauge. The Vertex VMS range of digital height gauges supports both 1D and 2D measurement. The Vertex VMS performs all functions as fully autonomous routines with no pipes of trailing wires. If communications are needed with peripheral devices such as a printer or network, then this is achieved through the RS232C or USB facility. 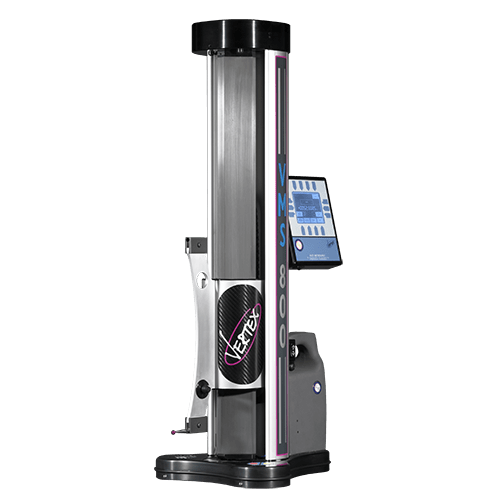 The Vertex range of digital height gauges also offers 2D measurement to supplement the extensive 1D functionality with powerful onboard processor firmware. The programmable 3 axis ECU is reminiscent of a “hole in the wall” display. The viewing area is kept clear apart from the key information being displayed. An ‘orbital keypad’ as the description implies is active around the viewing area offering the user an intuitive aspect with regard to software commands. The viewing screen is produced from a clear, robust polycarbonate material. The tactile keyboard indicates to the user that a command has been made. Ergonomic design provides a platform for accessing the multifunctional application software. A small selection of the probes and accessories available for the Vertex VMS are shown below. If you have any specific requirements and don’t see a solution below, please get in touch with our team who will be happy to assist. Available with ruby or steel spheres in 2,3,4,6 and 10mm diameters. Uses: Internal and external diameters, heights, drops, the distance between features, centre to centre measurement or diameters. Available in 6, 10 and 20mm diameters. Uses: Internal and external diameters and distance. Useful for features such as circlip grooves. Uses: Measuring small features such as holes in sheet metal. Uses: Sheet metal internal and external diameters, heights, drops and distance between features. Uses: Layout work on castings, sheet metal etc.